So looks like I'll be doing a spot of bottle feeding this week. Second ewe has lambed and unfortunatly had four! They've all survived so far but she's not going to have enough milk to feed them all. So I've bought some colostrum and powdered milk. They've all had a feed tonight and got full bellies, I'll just have to keep my eye on them now. Must be 18 years since I last reared a bottle fed lamb. Let's hope the next sheep has a single and I can adopt one over! I'm sure you'll get plenty of help with bottle feeding. The only time we had a ewe having 4 lambs it broke her pelvis and we had to have her destroyed. So it was definitely bottle feeding all four for quite a while. Col rigged up a bottle holder to do them all at once as I only had 2 hands! I'm afraid one lamb had to be put down due to a birth deformity but she hasn't taken to one of the three so I should imagine we might end up feeding one until a surrogate can be found. Bet you will have your children all wanting to help. 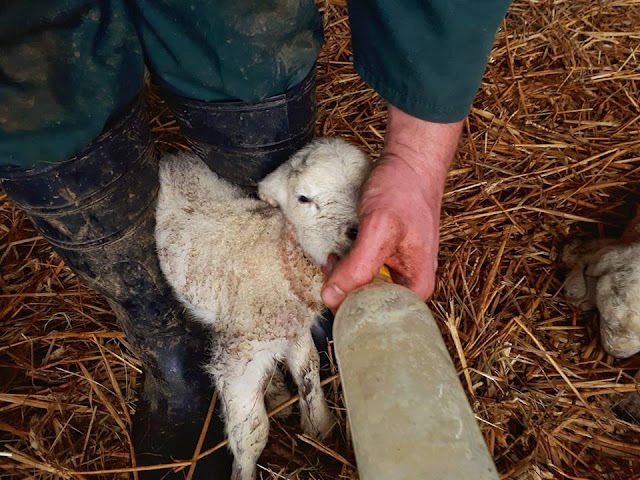 They love the idea of bottle feeding but whether they'll like it in practice is another thing! They four are a bit small but not as bad as you'd expect for a quad! One is now gone so we're down to three. at least they are in good hands with you brother! HA! I'm not so sure! Goes to prove more is not necessarily better, doesn't it? You have three good bottle-feeding helpers (your own very capable young ones) this time around . . . when they're available! Good luck finding a substitute mother for one of the lambs. Do you scan your ewes Kev? Although I’ve got a much smaller flock than yours I’m thinking of doing that next time around. I find even twins are much more of a management issue than singles so it would be good to know in advance. Four though! QUADS? I'd never heard of such a thing. I hope they all survive.